The M14ALCS Enhanced Battle Rifle Chassis Stock System is precision CNC machined from a solid billet of high strength aircraft grade aluminum. Fits Mil-Spec M1A/M14 rifles with standard or medium weight barrels. 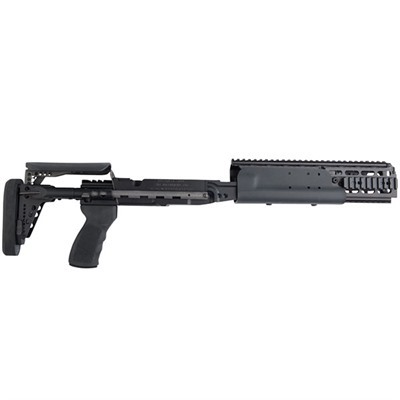 The M14ALCS is a drop-in chassis and features a six position telescoping stock and an adjustable polymer cheek rest with two inches of vertical adjustment. Additionally the chassis includes five Mil-Spec 1913 Picatinny rails, three ambidextrous sling mounts, a removable Kydex forend with a built in palm swell, and a soft one inch recoil pad. Rigidity of the chassis increases accuracy and reliability and is achieved through the use of a patented replacement operating rod guide block. Precision machined receiver lug recesses also eliminate the need for additional bedding. Fitting SAGE EBR chassis to non Mil-Spec/Commercial rifles may require additional gunsmithing. Does NOT accept rear-lugged receivers. SEPCS: Overall Length Collapsed- 27.5”. Overall Length Extended- 33.5”. Weight- 5.1 LBS. Finish- Mil-Spec Hard anodize.